533 mm TR Mk I2 х 3 pcs. 120 mm/45 BL Mk I4 х 1 pcs. 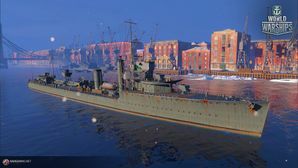 Wakeful — British Tier IV destroyer. HMS Wakeful was a W-class destroyer of the Royal Navy. She was built under the 1916-17 Program in the 10th Destroyer order. Wakeful was assigned to the Grand Fleet after completion, and served into the early years of the Second World War. Wakeful was torpedoed and sunk during Operation Dynamo by a German E-Boat on 29 May 1940. This page was last modified on 20 September 2018, at 16:38.